… is undeniably one of our most important dietary choices. Until recently, refined sugar, corn syrup, and chemical sweeteners were the only options to satisfy a sweet tooth in need. Today’s surging rates of diabetes, heart disease, and obesity – all preventable epidemics – are the unfortunate result. As consumption of sweeteners void of nutrition (often GMO and paired with chemicals and saturated fat), were found to be undermining our health, demand grew for alternative sweeteners. The wisdom of indigenous cultures has supplied healthy sweeteners to meet this demand – agave nectar, stevia, and more recently coconut sugar. By examining the food habits, traditional preparations and medicines of ancient cultures, we have begun designing a healthier foodspace by incorporating their superfoods, functional foods, and medicinal herbs. The new products routinely reaching shelves of health and gourmet food stores are widening consumers’ range of options. Though it is a a wonderful opportunity for all of us, it must also be supported by proper verification and consumer education to avoid misleading claims and false advertising. At Gnosis, we’ve assumed responsibility for keeping our customers informed of these advancements so they may choose wisely. It’s clear that people are increasingly aware that health is an investment made over a lifetime, and are willing to vote with their dollars for a more nutritious marketplace. Unlike unrefined sugar and high fructose corn syrup, agave and coconut sugar break down slowly during digestion, avoiding the sugar spike that contributes to the development of diabetes. Coconut Sugar’s glycemic index is 35, Agave Nectar’s is 27, and Stevia’s is 0 – all far less than most foods (honey’s glycemic index is 55-60 and high fructose corn syrup’s is 62). It’s also lower than that of almost every fruit, for example: grapes (47), oranges (42), and papayas (59). Coconut sugar, Agave nectar, and stevia all come from indigenous cultures that have sourced multitudes of curative herbs and foods. They are minimally processed, and our sources are all organic and sustainably grown & harvested. Unlike highly-processed sweeteners that offer no benefits to health-conscious and environmentally responsible consumers, these sweetners are grown and processed in ways that are truly healthy for us and for our planet. WE USE COCONUT SUGAR IN ALL OUR BARS, TRAIL MIXES, ELIXIRS & TRUFFLES! a little goes a long, sweet way! Stevia has a 1,500 year history of medicinal use in South America, and at 28% growth rate since 2008, it is clearly in demand. Stevia has no calories or carbohydrates, its glycemic index is 0 (!) and nutrients found in stevia leaves such as chromium, magnesium, manganese, potassium, selenium, zinc and niacin are known to help regulate blood sugar and blood pressure. We have added just a tiny pinch (leaves are 30-45 times as sweet as ordinary table sugar!) to sweeten our cacao without adding any additional glycemic load to your chocolate or waste to our majestic planet. We have also created a stevia-sweetened bar: our Freedom Bar! This bar is also infused with functional herbs that assist in blood sugar stabilization and the metabolism of glucose. WE USE STEVIA IN OUR FREEDOM BAR - OUR ZERO GLYCEMIC CHOCOLATE BAR! Traditional Mexican medicine makes use of agave for antifungal, antibacterial, blood pressure lowering and anti-inflammatory purposes. Agave nectar is extracted from the blue agave plant, a succulent that that grows chiefly in Mexico. The nectar is rich in calcium, iron, zinc, magnesium, and vitamins E, C, D, and E.
1.3 times as sweet as cane sugar, agave nectar imparts only its sweetness to the flavor profile of our chocolate – thus allowing us to highlight the flavor of the chocolate alone. This is unlike Coconut Sugar and Stevia, which gift a unique flavor to our bars! 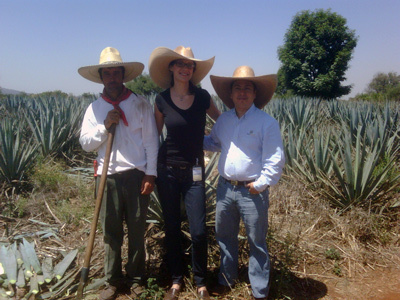 Vanessa visited our source of Agave in Jalisco, Mexico in 2010. Please read her entire report of the agave making process, including a rebuttal to the “agave controversy” below. WE USE AGAVE NECTAR IN OUR SEASONAL TRUFFLE COLLECTIONS!